SAL DeTRAGLIA'S VIRTUAL TAPAS BAR: A BREAK IN MY SKIING VACATION. If you’re wondering why I haven’t published anything during the past week, it’s because we were on a skiing vacation at the Avoriaz resort in the French Alps. But my activities at Avoriaz were not limited to skiing. I seized the opportunity to try another activity—namely, fracturing my shoulder. Yep, it’s true. For all of skiing’s positive aspects (and indeed, there are many), I’ve concluded that bone fractures rank quite highly in the negative column. They are, perhaps, surpassed only by being buried in an avalanche or devoured by a Yeti—both of which I chose to defer until our 2006 vacation. As such, my right shoulder currently hangs limp and lifeless within the confines of a turquoise arm sling. And that’s where it will remain for, at least, the next three weeks. I might’ve chalked this up as just a minor inconvenience (not to mention a welcome excuse to shirk my duties as head chef of our home) were it not for one minor detail: I’m right-handed. Let me propose a little experiment for my right-handed readers in order to illustrate my point. Before retiring tonight, go into the bathroom, grasp your toothbrush firmly in your *left* hand and try brushing your teeth in less than 27 minutes. Voila! You’ll quickly understand what a long, rotten three weeks await me. I don’t want to leave the impression, however, that my injury was a wholly negative experience. To the contrary, I am delighted to report that the Avoriaz Medical Center charged me a paltry 140€ for an examination, four x-rays and the aforementioned arm sling. Now, perhaps my judgment has been tainted by the 33 years that I lived in the US, but I consider 140€ to be an exceptional bargain for the medical pampering I received. At those prices, I almost regret not breaking more bones. By the way…if you’re wondering how I am able to type this post with an immobilized shoulder, the answer is…I’m not. This post is being dictated to—and typed by—the generous and tolerant Mrs. Virtual Tapas Bar. I fear, however, that her generosity and tolerance will pushed to the limit when dinner-time arrives. Why? Because I feel like a little Salade Niçoise and Coq au Vin tonight. There are a few surveys showing how excellent European healthcare systems are, you didn't need to check by yourself. Stick to blogging. It's far less dangerous! Great wines, naked ladies on TV, and now...excellent (and cheap) healthcare! I love living in Europe!!! As for the safety of blogging, I must add one caveat. 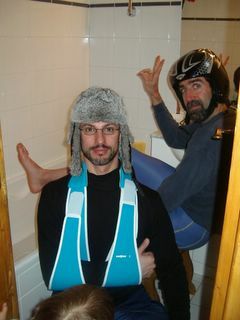 Thinking about your next blog article while skiing is definitely a bad idea--as my now-defective shoulder will attest. But you and Mrs. Fernie need not worry about one thing...I can still cook with one arm. Hasta pronto, my right-of-center friend! Hey Sal DeTraglia, I had a little time to kill and found your post titled this post. I wish I lived in Europe. I was searching for bar supplies. Don't ask me how but your site came up. I enjoyed some of your posts. They gave me an idea. Funny how things work sometimes, don't you agree? Anyway I gotta run late for work get back to you later. Thanks from Las Vegas!